TODD RITTMANN’S DEAD RIDER SIGNS TO DRAG CITY; NEW ALBUM, CHILLS ON GLASS, OUT MARCH 18TH. Dead Rider’s third ride, Chills On Glass, is as distinct from the second time around as The Raw Dents was from their debut, Mother of Curses. The goal for Dead Rider, always: super-heavy, super-driving, more ‘up’ moments than ever before. An album experience; listening, you’re put through some changes. Illusions radiating out from the real. You’re rocked into submission, but asked to participate on the listening level. Rebuilt, regrooved, with favorable upgrades. Chills On Glass moves forward in this tradition, juxtaposing high and low values – serious playing, danceablity, controlled-outcomes experimentation, don’t-give-a-f**k rad-itude. Shocks don’t surprise the band – it was the effect they were looking for, just what the song needed. All the sounds in the songs – the shouts, croons and whispers – draw you into the fantasy of Dead Rider, the spectacle of a night on the town, gliding through the darkness while thrust up, out of the limousine’s sunroof. Scribble, confetti and other sonic details rain down like snow, providing an exquisite dressing for thick and thrashing rhythms and expertly maneuvered tight corners. Vocal textures smooth and sandy rub together and ignite, blowing glass as you head your body through the labyrinth. Rhythm is king in Dead Rider, but melodies, changes and production carry the crest in this processional. Self-recorded, produced and mastered, Dead Rider leave no stylistic stone unturned in their restless path and no knob on the board untwisted in their search for the mixe parfait. This is composition that uses improvisation as an element within a larger structure – the ultimate streamlining of production, where songs are processed on several levels, mirroring and flashing their meanings through tactics and layers, backgrounded by a panaroma of yawning, silent, benevolent and black velvet. Todd Rittmann, infamous from his daze in U.S. Maple, is a guitar warrior with intensive craft at his fingertips. For the past five years, he’s been furthering his reputation by doing further damage with his instrument and others, reconfiguring sonic relationships, imagining the sound of a rock band reshaped into a gleaming spectacle, and by spreading the carnage wide with Dead Rider, comprised of Matthew Espy (drums, conga, percussion), Andrea Faught (synth, piano, trumpet, trombone, vocals), Thymme Jones (synth, trumpet, vocals) and Rittmann (vocals, guitar, drums). Lurching from pole to pole, pausing mid-stop, leaping and bursting into a double-twist and then resolving into a sweet glide; the dust they kick up in this fracas glitters gold, spicing the recipe with elevated powders of perception, deflecting metallically, hip-hoptically, free and jazzy, operatic, electronic, flashing like squad-car rollers. 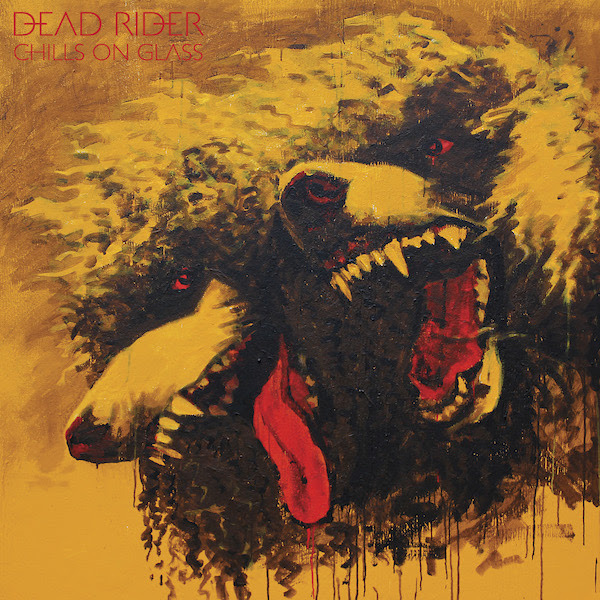 Dead Rider‘s third full-length album, Chills On Glass, is out March 18th on Drag City Records. Until then, here is a little teaser. Tags: Andrea Faught, Chills On Glass, Dead Rider, Dead Rider album, Dead Rider drag city, Dead Rider music, Dead Rider new label, Dead Rider teaser, Dead Rider video, Dead Rider's third ride, Dead Riders music, Matthew Espy, Mother of Curses, Rittmann, The Raw Dents, Thymme Jones, Todd Rittmann, Todd Rittmann drag city, Todd Rittmann music, Todd Rittmann teaser, Todd Rittmann video, Todd Rittmannnew music. Bookmark the permalink.